You can make your dorm room look great without spending a lot of money with these 7 easy ways to decorate a dorm room. You're moving off to college and your dorm room will be your first home away from home. You will want to create a space that will show off your personal style and reflect your own personality. No need to worry about matching your roommates' decor, decorating a dorm is more about showing off your own creativity. 1. Go bold or go home! Use bright and bold contemporary colors like mustard yellow, turquoise, or coral. 2. Show off your trendy side by using contemporary prints such as chevrons in your decor accessories. 3. Snuggle up to trendy bedding. Using a bold color and pattern in your bedding is one of the best ways to add interest to your room. 4. Light up the night with hanging LED paper lanterns. Not only do they come in different colors, shapes, and prints, but paper lanterns are inexpensive, adding the fun factor to your room. 5. Deck the walls. There are many ways to add color and pattern to your walls without painting. Decorate walls by using removable wall decals, removable wallpaper, hanging fabric, or even using duct tape. Duct tape is used today in many DIY projects and crafts. It comes in many patterns and colors and can easily be used to create a focal wall. Try adding stripes or chevron to your main wall to add more drama to your dorm room. Don't be afraid to go bold on your walls. 6. Pad your tush! Rugs are a great way to add color and texture to a room. Rugs will also be useful an for an additional sitting area for all of those late night chats. 7. Do it yourself! There are many DIY projects that are easy and inexpensive that are sure to show off your own creativity. Make some of your own decor for desks and walls with succulents. Check out this easy Coastal Succulent Holder, Succulent Book Planter, and Succulent Wall Hanging. Create a $12 Fabric Covered Bulletin Board. Making Lemonade has an easy to follow tutorial. Create your own Herringbone DIY Canvas, I Should Be Mopping the Floor gives a fast and frugal idea for making your own wall decor. Go crazy with tassels. They are hot in wall decor these days and easy to make DIY stuff with. Here's a great way to make Tassel Garlands from Pizzazzerie. Make your own headboard like the one from All things thrifty. Create a no-sew fabric scrap valance. It adds vintage and shabby chic charm! 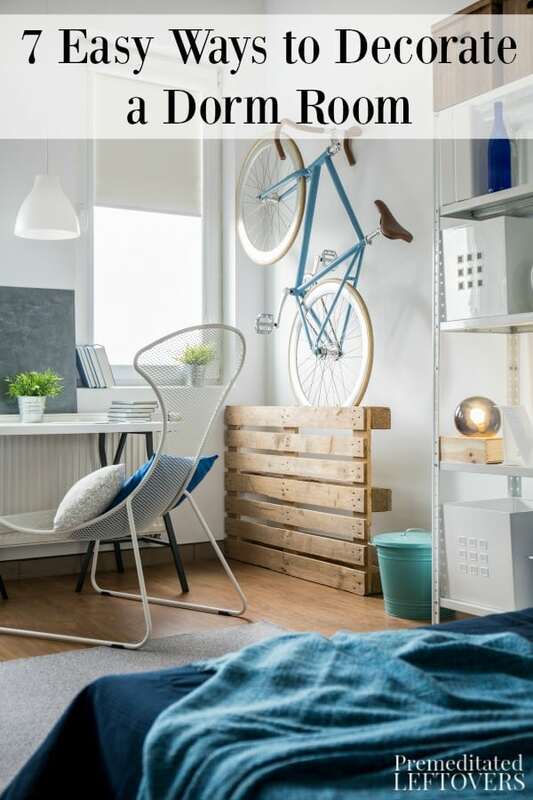 Decorating a dorm can be challenging for many students, however, there are many ways to create a space that will allow you to feel at home. By using these easy tips, you will be able to take your dorm room from drab to fab in no time flat. how to decorate my dorm room in reasonable budget..how will i make it colorful and attractive without using paints.